When I started in the role of Community Manager it is fair to say that my focus was mainly on the forums. There was (and still is…) so much work to do to get the place in order that it was a clear priority. It wasn’t until I’d had my hands dirty there for several months that I decided to tackle some of the other social media avenues. We already had a Facebook fan page which had a small following but very little direction. Our Twitter account had 60k + followers but again there was not much of a strategy in place, outside of autotweeting new blog posts and articles. I decided to tackle Twitter first. It was not a conscious decision, but rather one borne out of what turned out to be a very lucky mistake. In an early foray into TweetDeck, I made the rookie mistake of tweeting from the wrong account. While it wasn’t as bad as the famous Vodafone tweet-tastrophy, it was enough to have my stomach in my mouth for a few minutes. For those of you that don’t follow us, I tweeted “Kids in bed, taking my laptop and a beer out to the deck. Yup, I DO call this working”. Turns out that it was one of our most popular tweets ever, and it earned me a big thumbs up from the boss. So from there my Twitter campaign was born. People like to know that there is a person behind the keyboard. Sure, our autotweets are useful as resources, but it’s the personal touch that evokes the responses. My Facebook strategy was a little more planned. I started out by researching other popular fan pages and by asking our current fans what it is that they wanted from us. The results were pretty standard across the board. People wanted cheap stuff. No surprises there. So from that, Facebook Friday was born. I also focussed on using our fan page to disseminate more information – some people didn’t know about our articles, others didn’t know about blogs – and none of you knew about our coffee mugs! Our fan base started to climb rapidly – we hit the 5000 mark a couple of weeks ago. The next phase of the strategy is to do something about the aesthetics of our fan page. Enter the virus. We have decided that because our fan page is all about our community, that we want to do something about helping you make your mark on it. We want to design our new landing tab around a collage based on your photos. If you want to take part, head on over to our fan page and upload your photo. In order to qualify for the collage, please ensure that your photo is of your face only and is no larger than 50 x 50 px. There is a catch though — you need to tag us in your status update. To do so, type (rather than copy and paste) “I’m going to be at @SitePoint forever! Check me out â€¦” After typing the @, pause and wait for a dropdown list to appear. From that list you can select SitePoint, which will activate the tag. You only have until the end of this week to take part, so get on over there now. Next week we’ll be launching a new competition at the forums. July is all about Photography here at SitePoint, with the launch of our new book Photography For The Web. If you like to take the odd picture, then make sure you check out our Photography forum this time next week to find out how you can be in to win. I’ll give you a clue – if you like treasure hunts then this is the comp for you. We are having a brainstorm on book topics this month and we want to know what you want to read about. 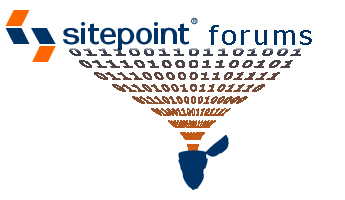 Head over to News and Announcements and tell us what subject you’d like to see a SitePoint book about. The Official SitePoint T-Shirt Competition results are out. The poll was so close that we have decided to go with both the front runners. I’m working on getting them into production now and will let you know was soon as we have something for you to get your hands on. I love this thread in General Chat – it invites you to showcase your best web masterpiece. Let’s see what you’ve got. In the Accessibility and Usability forum there is an interesting discussion going on about the styling of external links. How do you deal with them? Finding the right PHP developer is an issue dear to my heart right now. It is being discussed in the PHP forum this week. And the last one for this week is from the Web Page Design forum. Do you think that our web technologies need a complete overhaul? So until next week – ciao.